I found out about the idea of making a new season of Prison Break last year and I am intrigued of how they were going to pull it off. So when I got the chance (albeit late by almost a year), I decided to binge-watch this one and finished it off in 3 days. Without further ado, here is more about the series. The first episode basically told us what the rest of the gang who were still around from the fourth season was doing now. Lincoln Burrows (Dominic Purcell - Blade Trinity, Legends of Tomorrow TV series etc) was back to his old shady ways, while Sara (Sarah Wayne Callies - The Walking Dead and Colony TV series etc) was now a house wife happily married to a college professor named Jacob (Mark Feuerstein - Royal Pains TV series etc) while taking care of her child Michael Junior. Meanwhile T-Bag (Robert Knepper - Hitman, Transporter 3 etc) was just released from Fox River prison and another former inmate C-Note (Rockmond Dunbar - The Path TV series etc) had become a religious Muslim cleric working on anti-radicalization in the US. And finally Fernando Sucre (Amaury Nolasco - Transformers, Telenovela TV series etc) who now worked as freelancer in a cargo ship. When there was a hint of possibility that Michael Scofield (Wentworth Miller - Resident Evil: Afterlife, Legends of Tomorrow TV series etc) was still alive, Lincoln dropped everything in US and try to look for his brother who seemed to be in a Yemen prison. Together with C-Note and an associate he knew in Yemen named Sheba (Inbar Lavi - The Last Witch Hunter, Imposters TV series etc), Lincoln went to the conflict ridden and dangerous Yemen to search for Michael. It would be revealed later that Michael was indeed in that prison, and befriended with another inmate he called Whip (Augustus Prew - The Secret of Moonacre, Pure Genius TV series etc) and were trying to escape from the prison. So how could Michael still be alive and in Yemen jail? Could he escape the prison and be together with his family again after 7 years? Find them all in this intriguing TV series. To tell you the truth, I was surprised when it was announced of the making of the fifth season and I was also thinking why they had to do it. I was a fan of the series and I loved the first and second season, but I felt the third season had a lower quality and too short (due to the writers strike in Hollywood then) and the fourth season was no longer about a prison break but more of a conspiracy theory kind of story. I thought and felt that the ending of this series was done beautifully even if it was a sad one, so I really felt there was no reason to revive the story. But, after I saw the pilot episode of this fifth season (which was also called Prison Break: Resurrection) I was hooked again. Yes of course the plot of how Michael was still alive was a bit far fetched, but hey if they can revive anyone in movies or TV series, why not Michael Scofield, the beloved anti hero who went to prison just to save his big brother? Naturally a prison break series would not be fun if there was no prison escaping element. And this one had got it and despite having a shorter period (only half of the season was about the prison break plot), it was still fun to see how Scofield was such a genius and should be considered as a great escape artist. And this time, due to only having 9 episodes, the series felt to have a very intense and suspenseful feel about it. It was unlike the 3rd season which felt draggy at times but too fast at the ending. While in this season, I totally loved everything from start until episode 6 which had very fast pace. Then I think episode 7 slowed down a bit, but episode 8 and 9 were having multiple plot twists which were surprising and I was having a mind blowing experience when I found out about the use of Scofield's hand tattoo. OMG that was amazing and I still felt the sensation of that scene while I am writing this. The rest of the gang were having less screen time (especially Sucre) but I liked the story relating to T-Bag in here. The ending of this season, though seemed to conclude everything, I think there was still a room to extend it further. Which I understand was already in process of the making of season 6. Problem is, the audience might be feeling a bit tired as I noticed that this fifth season was not having as many viewers as the prior seasons and I am just worried that it would be cancelled in the middle or rushed to finish with lots of loose ends if the rating was very low. Anyway, we will see how it unveiled in few months time. 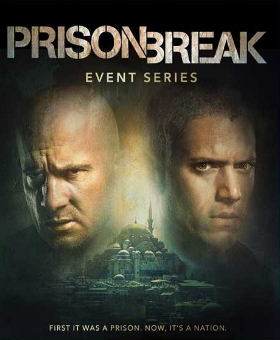 So if you are a fan of this great series and want to see Michael Scofield does it again to escape from prison, then you can definitely watch this season, if not for the quality, at least for the fun nostalgia. Be warned though that if you expect to see a long game of escape plan came to fruition or a lot more drama, it might not be enough as it was having only 9 episodes. However, this one had a really wonderful battle of wits between Scofield and his adversary with code name Poseidon. Hope you enjoy this season as well.